KATY RUBIN SHOWN WORKING ON LET ME IN! DEJAME ENTRAR!, A BI-LINGUAL SHOW BASED ON IMMIGRATION AND RACISM ISSUES PRESENTED BY THE PEOPLE’S THEATRE PROJECT IN NEW YORK EARLIER THIS YEAR. THIS WEEKEND KATY IS LEADING A THEATER OF THE OPPRESSED WORKSHOP IN NEW HAVEN. 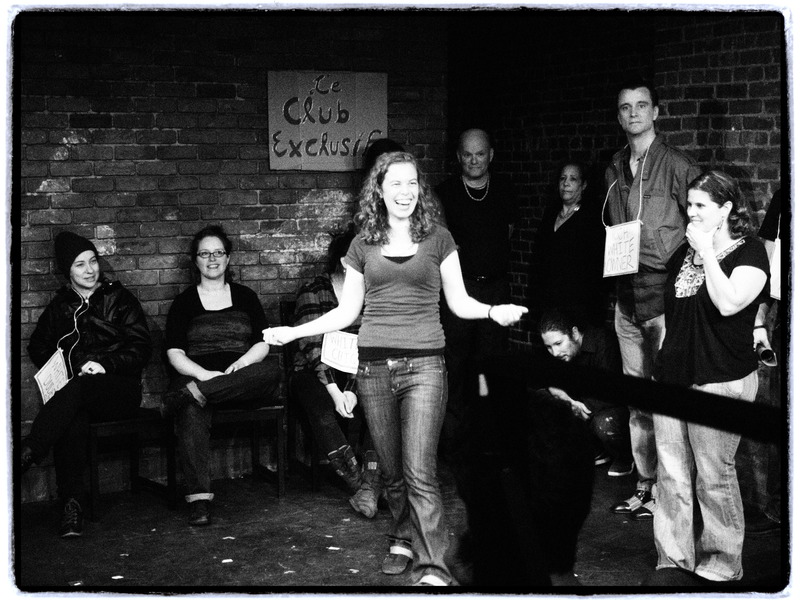 “Anyone doing Theatre of the Oppressed in New York can come together here,” says Katy Rubin, founding director of Theatre of the Oppressed NYC. Anyone in Connecticut as well, apparently. Rubin grew up in New Haven, where she was exposed to such diverse theater arts as circus skills, Bread and Puppet pageantry and summer outdoor Shakespeare. She attended the arts magnet high school Educational Center for the Arts, where one of the school productions she was in was the multi-compendium The Greeks. She’s studied theater in England, Wales and Brazil, is a core member (or “Rogue Artist”) of the “investigative, socially relevant” New York troupe The Anthropologists. She taught in public school in New York and juvenile detention centers in Brazil, run bilingual theater workshops and staged projects with homeless artists. All these experiences feed into Theater of the Oppressed New York, the company Katy Rubin founded a couple of years ago. The company uses concepts and techniques popularized by Brazilian theater theorist Augusto Boal by empowering those who’ve been denied basic human to take action and articulate their struggles through theater performance. Rubin was in Brazil in 2008 working with a variety of organizations and studying Theater of the Oppressed techniques with some of the form’s pioneers, including Boal himself. She’s been spreading TotP techniques through her New York teaching and directing gigs. This year she’ll be traveling to Nicaragua with a Connecticut project involving another socially motivated New Haven-raised theater artist and teacher: Aaron Jafferis, who’s working with the Bregamos Community Theater on a local production of A Peasant of El Salvador by the politically conscious Vermont clowning duo of Stephen Stearns and Peter Gould. The multi-part project begins with the workshop this weekend. Friday’s session is a general workshop on Forum Theater, the foundation of the Theater of the Oppressed discipline. Those who can’t take part in the entire workshop can still get something out of this intro, and are also invited to the closing session on Sunday afternoon—a performance worked up by the 20 man full-weekend participants.The full-scale workshop—Friday from 6-9 p.m., Saturday from 10 a.m. to 6 p.m. and Sunday from 10 a.m. to 7 p.m.—has its tuition fee set on a sliding scale from $50-$150. If you’re only attending the Friday and Sunday sessions, admission is ten dollars for each. “Joker” is Augusto Boal’s term for those who adapt and implement Theater of the Oppressed shows. The process has been adopted worldwide as a way to adapt classic works, and create new ones, so they are freshly relevant to their immediate performers and audiences. Not all the participants in this weekend’s Theater of the Oppressed workshop—a varied lot of artists, activists, and teachers—will be heading to Nicaragua. Some will apply what they learn at the workshop to projects in Connecticut and elsewhere. Those who be part of this weekend’s activities will have other opportunities to see or otherwise involve themselves in future aspects of this multi-faceted New Haven/Leon Sister City Theater Project. There will be performances of A Peasant of El Salvador Aug. 4-6 and 12-13 through the Bregamos Community Theater in New Haven’s Fair Haven neighborhood, after which the delegation presenting the play will travel to the Nicaraguan city of Leon, a longtime “sister city” of New Haven’s. Both the New Haven Sister Cities Project and the Bregamos Community Theater are active sponsors of the theater project, which has also gained support from the International Association of New Haven and the Yale-based Center for Latin American and Iberian Studies with some funding from the U.S. Department of Education. For details, check the New Haven Leon Sister City site. 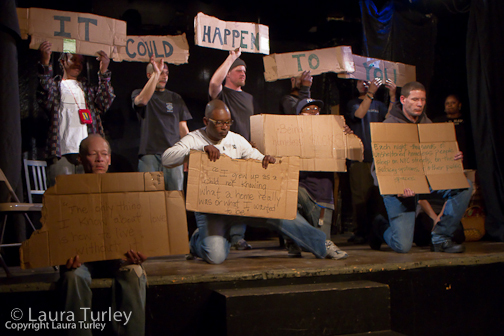 PHOTO BY LAURA TURLEY OF THE JAN HUS THEATRE TROUPE PERFORMING IT COULD HAPPEN TO YOU LAST FALL. KATY RUBIN HAS DEVELOPED A NEW PIECE WITH THE TROUPE (WHICH CREATES WORK BASED ON THEIR EXPERIENCES AS HOMELESS NEW YORKERS), HELLTER SHELTER, WHICH WILL PREMIERE THIS MONTH. While training New Havenites for a Sister City collaboration, Rubin has also been readying a New York tour of Hellter Shelter, the original theater piece she’s developed with the Jan Hus Homeless Outreach and Advocacy organization. The show, described as “a story of corruption, discrimination and dehumanization in the NYC shelter system, told through original documentary footage, interactive theatre, break-dancing and laughter,” has five Pay-What-You-Can performances at a variety of venues between June 9 and 22. She’s also got Theater of the Oppressed workshops planned in New York in June. In Brazil, Boal’s teaching and techniques are more commonly used and accessed. Adapting them for cities in the United States has been an interesting experience, Rubin says: “You’re going into a community that’s different from one you might have been part of yourself, and it can be a delicate situation”—even if that community’s in the same town where she grew up. Articulating and sharing the concerns is the goal. That’s what this two-city, multi-leader, international performance project is all about. KATY RUBIN LETTING US IN AGAIN, THIS TIME IN COLOR. I really don’t also know the way I ended upwards listed here, however believed this kind of release was previously superior. I do not comprehend what you do on the other hand absolutely you will a famed blog writer should you usually are not witout a doubt. Regards!